Anno Online is a free-to-play, browser-based MMORTS which features complex management and in-depth economics elements. 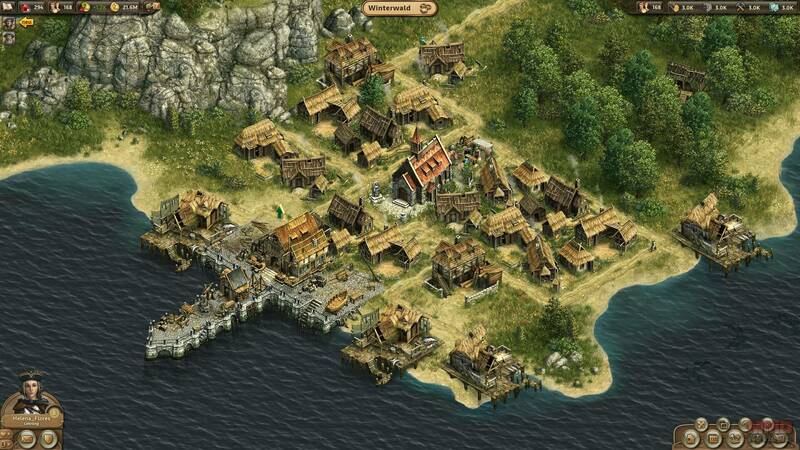 The game allows players to build and develop big medieval cities on their own island as they construct new buildings, manage their production, satisfy the needs of their population, and set off to discover and claims additional islands. The game counts with more than 200 differently looking buildings, with a vast amount of details and may be inspected in a close up manner, which allows players to build cities with more than 1,500 buildings in order to bring life to vivid displays of historical city creation and realistically diverse economies. Construction requires building materials and resources that have to be collected first. More advanced buildings are automatically unlocked when the population reaches a set number of inhabitants. Pioneer Residence - Pioneer Residences increase the amount of pioneers in the city, thus potentially increasing the player’s overall income when they are kept happy and supplied with everything they need. Residences need access to a marketplace and roads connecting them with other locations that provide food, drinks, clothing, community, services, faith, and entertainment. Chapel - A Chapel will provide your community with faith to accommodate their. Marketplace - Marketplaces are key structures for a working city as they sell goods and supplies to all residences within their influence area, providing a main source of income. Shipyard & Naval Engineer - Ships that are needed for trade and exploration are built in the shipyard. To start working, the shipyard needs several pre-produced ship parts which can be made in the naval engineer building. Distribution House - These buildings send collection carts around its influence area to collect goods. Upgrading these buildings will increase the number of carts used for collections. Warehouse - Warehouses send out carts to gather finished products from workshops. These goods will be ready to use as soon as they arrive. They also provide carts and new collection areas. Mill & Bakery - The Mill turns wheat into flour that the Bakery uses to produce bread. Fisherman’s Hut - A Fisherman’s Hut has to be built close to the shore around the harbour and needs fish in its influence area to be efficient. Farm & Goat Farm - The farms require enough space to build farm fields in order to produce food (cereals and meat). Sheep Farm & Spinner’s Hut - Woollen garments are woven from wool produced at a Sheep Farm which needs pastures within its influence area. The Spinner’s Hut then weaves the wool into clothing. Lumberjack’s Hut - The Lumberjack’s Hut produces wood, the most important building material. It must be connected to a warehouse to deliver the resources. Mason - A Mason produces stone from a stone deposit which is needed to build more solid homes, workshops, and roads. Carpenter Workshop - Carpenter Workshops provide the player’s community with services that they need as well. The game also includes many multiplayer possibilities, for example you can visit other player’s cities and help to enhance its productivity. In addition players can join guilds to build stunningly massive monuments, or establish trade routes with their guild mates, having the opportunity to be part of a giant empire and work towards joint goals and server-wide quests. The game enables players to customise their ships, avatar and guild logo. Players may choose between over three millions of different combinations and show off their personal style to all other players. There are male and female avatars available whose hair can be dyed with an individual colour. Ship hulls can be dyed as well. Quests and achievements will unlock additional content and allow players to display their progress in the game. Trading is an essential element of the Anno Online experience and involves advanced commercial features such as ship renting, sea lanes, etc. Players will be able to trade with everyone in game, setting up and accepting trade offers from other players. They will watch as their ship leaves the harbour and sets sail to pick up their goods to returns later on with its load. Harbours will be bustling scenes of commerce, with all of the trading partner’s ships coming and going. Looking for more Free MMO Browser-based games,Free MMO management games,Free MMORTS,Free MMOs games?